Phil Lord and Chris Miller may be two of the hottest comedy directors going right now thanks to their back-to-back-to-back hits with Cloudy with a Chance of Meatballs, its sequel, the remake of 21 Jump Street and The LEGO Movie. The latter is probably of the most interest to SuperHeroHype readers, because they were able to bring in the likes of Batman, Wonder Woman and Green Lantern, DC superheroes who obviously have ties to the film's distributor Warner Bros. Pictures, which definitely added to what made the movie such a success. Now, DC's competition Marvel Comics also has a relationship with LEGO, both from their playsets and figures but also from the Marvel LEGO Super Heroes video game, and anyone who has had fun playing that game may have wondered why we didn't see any of those characters in The LEGO Movie. 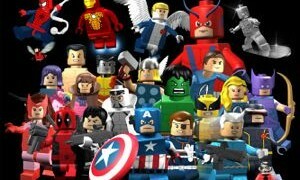 Obviously, Marvel doesn't need the added promotion of having characters from their comics and movies appearing in The Untitled LEGO Movie Sequel (or whatever it ends up being called… probably "The Rise of Something"…), but let's face it: fans of LEGO and the Marvel characters would absolutely flip out if they could make that happen, since it may be the closest we see to the characters from the different comic universes interacting. While Lord and Miller are still probably early in developing the script for the sequel, we figured it wouldn't hurt to ask if there's been any communication between them and Marvel about bringing some of those characters into the LEGO movie world. And that's exactly what we did when we sat down with the duo at the junket for their comedy sequel 22 Jump Street. For those who don't have video capabilities, this is what they had to say on the chances of seeing some Marvel characters in the sequel. Phil Lord: "Marvel seems to be doing fine on their own." Chris Miller: "They don't need LEGO to make their movies successful." Phil: "It's really hard to convince a company, especially business affairs, to do something, because it would be cool or fun. It takes a lot of effort." Chris: "And then (in) ‘The LEGO Movie," definitely, there were a lot of behind the scenes legal and business affairs wrangling to get a lot of the stuff we had in that one." Phil: "We hope so. Hopefully it will be like another Roger Rabbit situation where, ‘Of course, we'd love to be a part of this,' but who knows?" Look for the rest of the interview with the guys talking specifically about 22 Jump Street, which comes out on June 13, over on ComingSoon.net next week.